Kumasi has been on my mind a great deal this week. Ghana’s second city was called “the garden city” before independence in 1957. It’s not very green now, but the city still has the biggest open air-market in west Africa and a number of attractions for visitors. It remains the home of the Asantahene, the King of the Ashanti, one of the most powerful men in the Republic of Ghana. Exactly forty years ago, my wife and I were visiting the city once a month. We pastored a church there, as well as one in Accra, the capital, where we lived. One of the joys of visiting Kumasi was spending time with Charles and Comfort Akowuah. At the time, Charles was the deacon of the local church. He had a huge chicken farm outside of Kumasi. The Akowuahs had two children, Loma and Richard (also known as Yaw). Our children and theirs would play together. 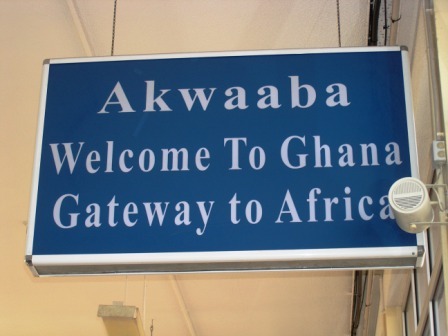 We first arrived in Ghana on May 27, 1978. At the time, the country was going through some major problems. The economy had collapsed with an inflation rate of 600%, the military was in power, a “palace coup” took place just a few weeks after we arrived, and a revolution took place a few months later. It was difficult to buy anything in the stores. We were in culture shock for a while after arriving. Charles and Comfort were a great help. At some point during our first five-year stay in Ghana, Charles was ordained an elder of the church. We worked very closely in serving the Ghanaian people. During that five years, the church grew considerably. We maintained our friendship even after a split in the church in 1995, which affected just about every country in the world. We had dinner with them on our last visit to Ghana. Whenever we visited Kumasi, we would visit the restaurant they started over twenty years ago, “Friends Garden,” a popular, open-air meeting place right in the heart of Kumasi. Conversations would always last late into the night. Sadly, Charles died of cancer on Sunday. Charles’ funeral will not take place until 20th October. This will enable friends and relatives in the Ghanaian diaspora to get back to Kumasi for the traditional funeral rites. Ghanaians have the best funerals in the world. If I could be there, I would be, joining in the celebration of Charles’ life. His son, Richard, will be there from the United States; sadly, their daughter died some years ago, from complications that arose from sickle cell anemia, the end of a life-long struggle. Thank you, Charles, for some wonderful memories. Comfort, keep the business going – we hope to pass through Kumasi again someday. Will red-red or fufu be on the menu? Damfira due, dear friend . . .
LONDON TERROR – INCIDENT OR ACCIDENT? The road to Kumasi was always a challenge. It was exactly 168 miles from our home to the center of the city. The journey could take anything from 4 to 6 hours, depending on traffic and weather, as well as the state of the road, which varied. There were well-paved stretches of road, but there were also considerable distances of mud, where you could easily get bogged down, especially if it was raining. The rain was always a tropical storm, a. positive deluge, which could quickly wash the road away. There was no shelter, just thick rain forest on either side of the highway. Sometime in 1982, during the rainy season, my American colleague and I, together with our son Kurt, who was only three, were driving back to Accra from Kumasi, after dark. We had four church members in the back of our Landrover (jeep). In the middle of a heavy storm, we had a major accident with a bus, full of passengers heading to the capital. We were all under a deadline, as there was a curfew at 10pm. Our vehicle was hit by the bus and completely turned around, as it spun into a stone wall, demolishing it, before coming to a halt. I had grabbed hold of our son (there were no seat belts in those days). He and I did not have any serious injuries; my colleague, Steve, had a cut on his head and at least one of our passengers was thrown out of the back of the vehicle. Making things worse was the endless, heavy rain. In the weeks that followed, we had no vehicle. It turned out that the bus driver was drunk and had been dancing in the aisle while driving in a heavy storm. Theoretically, we could have gone to court and received compensation from the bus driver’s company to buy a new vehicle. But it wasn’t that simple. Our lawyer, a prominent Ghanaian, said it would be pointless going to court. The local police were not co-operating and the judge and jury wouldn’t either. One reason was tribal affiliation. People in Africa identify with their tribe, first and foremost. As the people on the jury would be of the same tribe as the accused, who came from that area, the man would be found not guilty; so what was the point of going to court? That’s how it was explained to me. I was reminded of this a couple of days ago when watching Sky News. There was a report about a terrorist attack in London, when a 29-year-old Muslim man from South Sudan deliberately ran his vehicle into a group of cyclists riding past London’s iconic parliament building. The man was in London to obtain a British passport, having just been granted British citizenship. Sky News questioned some of the man’s friends, all Muslims. They were all in agreement, that the incident was just an accident, not a terrorist incident, that Muslims are always blamed for terrorist attacks, when no Muslim would ever do anything like that. It reminded me of that accident almost 40 years ago. Again, tribal affiliation makes policing virtually impossible. Thanks to Acorn, a streaming service similar to Netflix, offering shows from the UK, Canada, Australia and New Zealand, we have been able to watch a number of shows from England. Crime shows, especially, portray the complexities caused by the reality of multicultural Britain, where everyday policing is made virtually impossible for the same reason it was pointless trying to have the drunk driver of the bus prosecuted following our near-death experience. If the man is still alive, he is probably still driving buses in the pouring rain on difficult roads, dancing in the aisle while consuming lots of beer! Sometime this week Australia’s population reached 25 million. Nobody knows exactly who is number 25 million – it’s more likely to be an immigrant arriving in the country than a new born baby; but 25 million is now the number. Australia, in recent years, has been taking in 240,000 immigrants a year, compared to an average of 70,000 per annum in the twentieth century. Prior to Gough Whitlam’s Labor administration (1972-75), Australia had a “white Australia” policy, in an attempt at preserving the country’s European culture. At the time, most people were descended from the Anglo-Saxon-Celtic peoples of the British Isles. Today, with declining birthrates in western Europe, most immigrants come from Asia and the Middle East, peoples of very different cultural backgrounds. Eighty years ago, the big fear was of a Japanese invasion. After World War II, there was great concern about the Chinese. Neither invasion took place. But a new generation of Australians is permitting a different invasion of their country. The end result is likely to be that Australia will become an Asian republic, with all that implies. 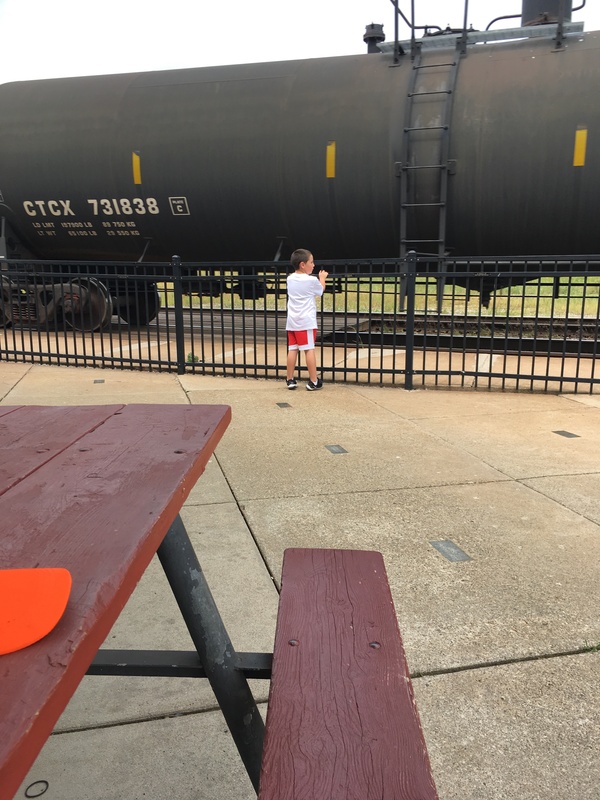 I took Aubren on Wednesday for a day in Durand, a small town east of Lansing that has a railroad museum and remains a fairly busy train terminal, almost all freight. This means you can sit and watch trains while eating lunch. Aubren loves it and likes to play with the model train in the museum. We were there for a few hours. The man in charge at the museum said that they get many autistic children visiting. For some reason, they love trains. He certainly felt at home there. On Thursday, it was Leeson’s turn. I took him to a big pet store to see all the snakes, lizards and spiders. At first, he wanted me to buy a tarantula. He was inspired by a young lady who was standing next to us, checking out all the creepy-crawlies before buying one. I saw no evidence that she was married, which is just as well. I would also caution all single males to check out the girlfriend’s hobbies before contemplating marriage! But, Leeson wasn’t so interested in tarantulas as he was in snakes. We ended up in the snake section (yes, there is one), where he asked the manager if he could hold a snake. Yes, he could. He chose the candy cane corn snake. He held it for some time, offering me the opportunity to do so. I declined, saying I needed to keep my hands free to take pictures for his mother. My excuse worked! 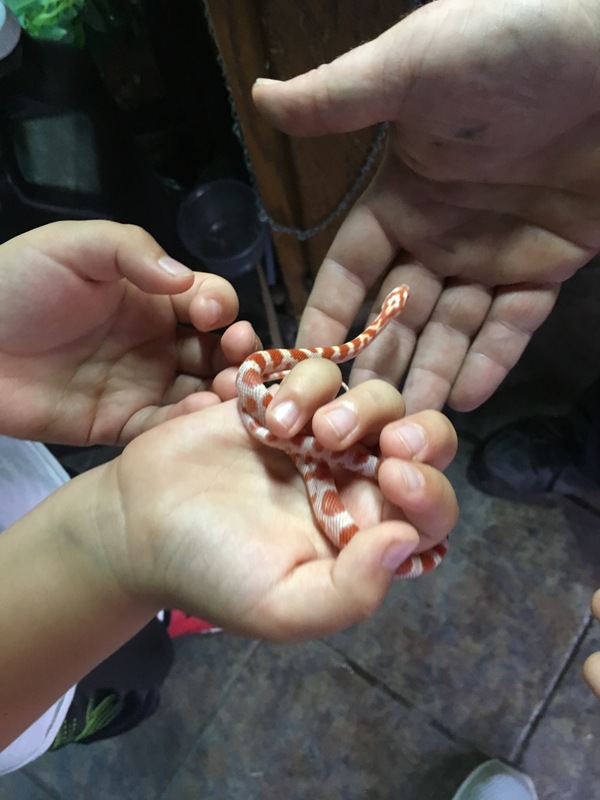 Leeson is only five and asked the store manager, Jason, lots of very intelligent questions about snakes and how to take care of them. He revealed that he already has a garter snake, which is hiding in the woodpile in our back yard. In conversation, I told Jason I was watching PBS’ ‘The Outback,” on the previous evening. Australia has more dangerous creatures than anywhere else on earth (and they still have 240,000 people settle there each year!). Jason told me he had seen a documentary on Australia, where the American presenter commented on all these dangerous creatures and asked the Australian animal expert if there was anywhere in Australia that was safe. The Australian responded with: “Yes, the classroom!” Good point! Through these two boys I’ve learned a lot about both trains and reptiles, far more than I ever wanted to know, in the case of the latter. A young father in Colorado murdered his pregnant wife and two young daughters on Monday. We’ve had similar tragedies in Michigan in recent years. It seems that, today, parents (particularly the father or step-father) are the greatest danger children have to face. It’s a national tragedy. Why does this keep on happening? Apparently, the couple was having financial problems and had had an argument that morning. TV news reported from outside their home, which was a modern mansion. Coincidentally, I checked a new book out of the library this week. The title is “Squeezed: why our families can’t afford America,” by Alissa Quart. According to a recent newspaper article, 70% of Americans are struggling financially. They live paycheck to paycheck and are heavily in debt. It starts with student loans, then a car loan and a mortgage and progresses downhill from there. But, why does a small family like the one in Colorado, need such a big house? A PBS documentary over twenty years ago showed that the average family home in the 50’s and 60s was 1,100 square feet, with a garage for one car. Forty years later, the average new home was 2,000 square feet, with a 2½ car garage, usually used for storage. Now, it’s even worse. The title of the documentary was “Affluenza,” highlighting a disease that too many people suffer from. We need bigger and bigger homes to store more and more things! And it’s all built on debt. Where’s the sense in it? The stress that it all leads to is causing irreparable damage to families, including divorce and violence. We don’t know yet why the man in Colorado flipped and killed those he, at one time, loved. There’s never been a greater need than there is now for God to fulfill the last two verses of the Old Testament, a promise to “turn the hearts of the fathers to their children,” prior to Christ’s Second Coming. I find it unfathomable that a husband and father can do what this young man did in Colorado. A father’s role includes protecting his wife and children. Instead, today, too often the husband and father represent the greatest threat to the safety and security of everybody in the household. Of course, we have, in the last few decades destroyed the family in many ways, including totally upending God’s financial system. In the past, parents had to have children, partly so they could take over the family farm as they got older and could then provide for them in old age. Now we have social security. It’s taken away the “need” for children, who are now disposable. How much worse is it going to get?